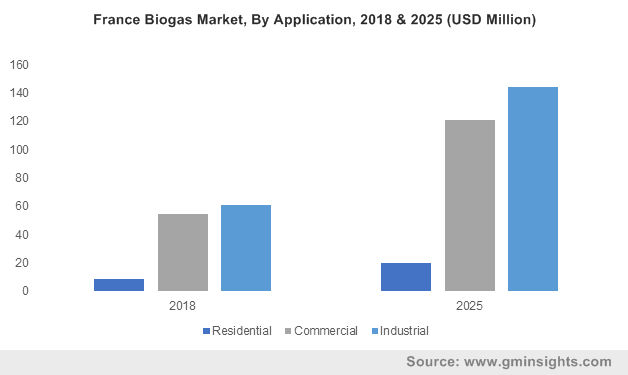 Europe Biogas Market « Global Market Insights, Inc. The shifting trends toward the anaerobic digestion of organic wastes and generation of energy from biogas are all set to impel biogas market in Europe. Having garnered a reputation of making substantial contributions toward the maintenance of green environment & energy conservation, biogas has found immense penetration across the food & beverages, waste-to-energy, power, and technology industries. Regional governments in Europe are encouraging the use of biogas across the region by providing tax benefits, feed-in-tariffs, and rebates to the end-users. Earlier this year, Germany has announced its goal of lowering carbon emissions by 40% till 2020 and by 95% up to 2050. It has been projected that renewable energy would account for 60% of the country’s overall energy consumption by 2050, thereby creating a favorable growth path for the country in Europe biogas market. Biogas power stations have also accounted for a major portion of Germany’s bio energy industry. The region possessed nearly 8900 of biogas power stations in 2015, which is another positive indicator that Europe biogas market would accrue lucrative gains in the ensuing years. Firms such as Geotech and Ansyco have firmly established their presence across Europe biogas market through the launch of novel gas analysis technologies. Recently, in a bid to expand their product portfolios, both the firms have collaborated to develop an innovative system referred as BIOGAS 3000 capable of effectively & constantly monitoring and analyzing of biogas production processes. In an important breakthrough witnessed across the biogas industry in Europe, DuPont and Bock UK Limited have also made a strategic pact that will help the latter depict DuPont’s new biogas enzyme technology referred as OPTIMASH® AD-100 for its commercial sale across the U.K, which would certainly augment Europe biogas market. Biogas is inherently deployed across the residential, industrial, and commercial arenas. The mounting demand for power supply, environmental awareness, and the rising preference for renewable energy sources have resulted in commendable demand & large-scale deployment of biogas manufacturing plants in Europe. As per estimates, biogas applications across the industrial sector in Europe will surpass an annual installation of 600 MW by 2024. The escalating requirement for low-power & cost-efficient technologies for treating biodegradable wastes is slated to impel Europe biogas market from commercial applications. With the rising trend of using sustainable energy across the continent, Europe biogas industry is expected to have bright growth prospects in the ensuing years. Effective government measures such as providing tax concessions and rewards for the biogas applications are expected to impel the growth of this business sphere in Austria, which would considerably augment the revenue graph of Europe biogas market as well. Germany, on the other hand, is expected to surpass 300 MW by 2024, subject to the rising need for curbing carbon emissions and maintaining a green environment. The numerous efforts undertaken by member countries are certain to stimulate the growth of Europe biogas industry. Rising economies of scale are expected to encourage companies to make heavy investments across Europe biogas industry. With the continent touted to be the hub for renewable energy in the future, it comes as no surprise to note that Europe biogas market has been forecast to surpass a revenue of USD 2 billion by 2024. This entry was posted in ENERGY, MINING, OIL AND GAS and tagged Europe Biogas, Europe Biogas Market, Europe Biogas Market Analysis, Europe Biogas Market Forecast, Europe Biogas Market Growth, Europe Biogas Market Outlook, Europe Biogas Market PDF, Europe Biogas Market Report, Europe Biogas Market Satistics, Europe Biogas Market Share, Europe Biogas Market Size, Europe Biogas Market Trends, Europe Biogas Market Update.